My mom, Gabriel and I stopped here for lunch today. They opened fairly recently and it looks clean and cute with it’s bright green chairs at the outside tables. There was no line and we took our time looking over the menu. There are so many great options, from create-your-own salads to panini, sandwiches, soups and wraps. 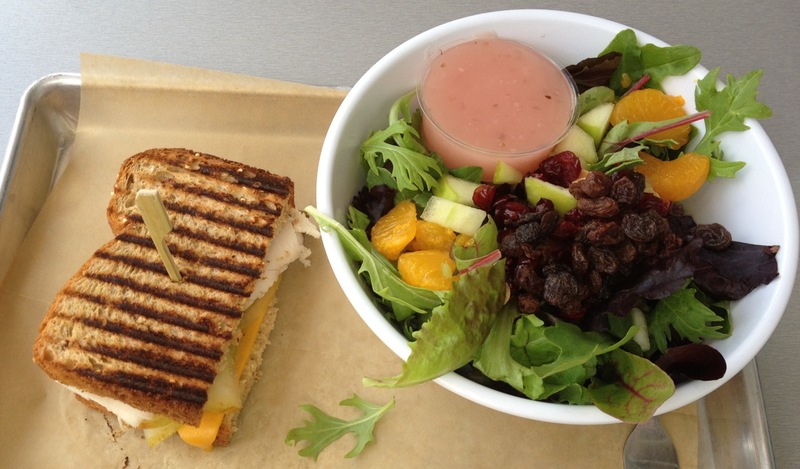 I decided on the you-pick-2 with a Market salad (mandarin oranges, almonds, cranberries, raisins, apples and baby greens) with the raspberry vinaigrette and the half sandwich (Turkey & Pear – Roasted turkey, cheddar, sliced pear, honey mustard on multigrain). The service was fast but pretty much forgot half of the ingredients for my salad so I had to go back and ask for the almonds, cranberries and raisins. I assume that the employee was new so I guess I can forgive that- but it was a pretty stupid error. The dressing was so-so, but since it’s fat-free, that explains that. I enjoyed my sandwich quite a bit, especially the grainy, thick toast it came on. Overall, for under $10 to have a healthy and tasty lunch is reasonable in my book. The convenient Main st location and outdoor seating is an added bonus. I’m sure I’ll be back. Would you like to purchase some cookware low cost?